I started hosting Thanksgiving dinner in 1999, after I purchased The Cottage. It was my very own home, not a rental and not living with a relative. My home, my kitchen. I was excited! My tables back then were simple but properly set affairs. 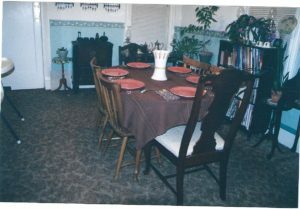 For my Thanksgiving table in 2005, I used a simple brown tablecloth and coordinating napkins made by Martha Stewart from an old 18th century pattern she had reproduced. Persimmon Fiesta dinner plates were paired with Great-Grandma’s Coronation flatware. The centerpiece was simple-my beloved Belleek Wheat vase made in Ireland. This is one of few photographs I scanned in before my scanner broke. There are other settings, but this is the only one I can share with you right now that is not on digital format. Thanksgiving tablesetting 2005. Simple but effective. Great food and the most fantastic family time was had!